"Brazil Slide Series: Collection Belem Manaus, Slide No. 0095." by Herbert Knup, Jon M. Tolman et al. Brazil Slide Series: Collection Belem Manaus, Slide No. 0095. 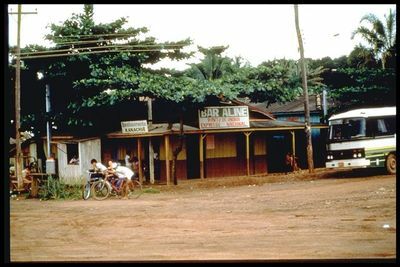 A regional bus waits at the station, which also serves as a bar. In the new frontier areas in the North, migrants have come from all parts of the country, providing a diverse ethnic and cultural mixture.Um ónibus regional espera na estação, a qual também serve de bar. Imigrantes de todas as partes do país têm vindo para as novas áreas de fronteira do Norte provendo diversidade étnica e mistura de culturas.